A young nun enters a convent, where she can only utter two words every ten years. After the first decade, she visits Mother Superior and says, "bed hard. "Ten years later, she says, "food bad. "After 30 years, she goes to the Mother Superior and says, "I quit." Hi, I'm Dina...but it's not about me...it's all about Jesus. Queen Cleo of our thriving Inktropolis graciously allowed me to extend the boundaries of nonfiction to include “not fiction.” So, I’m very excited to share one of my favorite books: Love Poems from God. 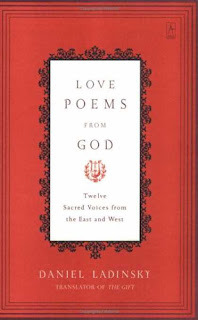 This collection of spiritual poetry by medieval writers centers around one of my favorite subjects: intimacy with God. Go ahead, read it again, two or three times, perhaps even out loud. All poems should be read several times to digest meaning on various levels. Think of the words, the sounds, the images, even the look on the page. I should explain that only about half of the poets in this book are Christians. The Christian authors offer especially exquisite portraits of God, portraits that will be familiar yet leave you more passionately in love with God than ever before. Most of these poets are nuns and monks who were at some point tried for heresy but were later recognized as Catholic saints. It seems their seclusion and celibacy gave them special understanding into the true nature of intimacy with God. Take a moment to ponder these lines by St. Thomas Aquinas. God then opened up and I entered Myself. Often we think of the medieval period as the “Dark Ages” and assume that Christianity was dead from the fall of the Roman Empire until the Reformation. This is far from true. Yes, there was much corruption in the church, but there were also amazing Christians who kept God’s Word alive for us in the convents and monasteries of Europe. While it’s unlikely that you will agree with all of their views, I think you will find much in this book that will bless you and expand your understanding of the divine. However, I would encourage you to step out of your comfort zone and read the poems by the Eastern authors as well. I believe that our Father God graciously reveals Himself to all who seek Him, and you will find many fervent seekers among the poets in this book. The first poem above was written by Rabia of Basri, a Sufi Muslim. This was particularly meaningful to me because my husband is Middle Eastern, and I have heard numerous tales of entire Muslim villages coming to Christ through dreams and visions in recent years. It seems that God was equally active in pursuing Rabia of Basri over a millennium ago. Just remember as you read these poems that all “truth” must be evaluated by “The Truth” found in God’s Holy Word. If you stay in that mindset, I think you will be able to enjoy the lovely verses and find much that will speak to you. One common criticism of this collection is that the translator, Daniel Ladinsky, may have put too much of himself into the poems. I’m not sure if this is true, or if he just did an excellent job of translating the poems into our contemporary English for meaning rather than literally word for word. Either way, his are the most insightful versions of these poems I have ever found. The authors and poems in this book provided much inspiration for my novel, Dance of the Dandelion, which is set in the medieval period. 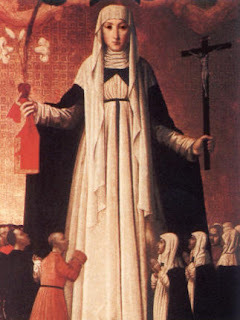 In fact, Love Poems from God includes poetry by one of my favorite women in history, St. Catherine of Siena, who I will be adopting as my alter ego here in “Inktropolis.” My fellow “Inkies” are looking forward with great anticipation to getting in a few good nun jokes on my behalf. It sounded like fun, so I thought I'd beat them to the punch. On a more serious note, I leave you with this short poem written by St. Catherine. Serious question of the day: What helps you to feel more intimate with God? Non-serious question of the day: If Jesus was alive today, what kind of car do you think he would drive? Also, feel free to share a favorite joke, nun or otherwise. For a chance to win a copy of Beth Moore's Praying God's Word Day by Day please leave a comment on this blog. Be sure to include your email address so that we can contact the winner. Include spaces around the @ for your protection. Winner will be drawn at random on Septmber 18th. Everyone who leaves a comment and email will also be entered in our grand prize drawing on November 1st. Dina, that was lovely. You know I think I will come back and read those poems again. Small bites to be savored, like the richest of chocolate, so you can fully appreciate them. For myself, I'd say that deepest intimacy with God comes when I see someone through His eyes rather than my own. Then I feel His burden, the overwhelming love He has for someone who I see with my limited human vision. WWJD? (Drive?) I'll get back to you. My first thought is one of those 15 passenger church vans. And I bet He wouldn't let Peter drive. Beautiful blog Dina. I can feel your passionate love for God reading it. BEautiful post, Dina. I think I feel most intimate during quiet time alone with the Lord, meditating and reading the Word. But I can also get that feeling in moments of pure worship. Even if I'm surrounded by a few hundred people. As for what car Jesus drove. That's too easy. He had a Hyundai Accord. I think he must have handed it down to the apostles though, because the Bible says "they were all in one accord"
Hee, hee okay I admit it, that was horrible. Anyone going to be at the conference, feel free to whack me for that one. Enjoying the answers so far. Lisa managed to squeeze her joke in with her car choice. That takes talent. Keep them coming. Lisa, consider yourself whacked. Yipes, what a pun! I would love to see these poems in the original, or a closer translation into English. They're beautiful but sound very "modern." If we go back and study the lives of some medieval saints, we see a radical Christian message. Something to which we in this present era can really relate. They were not all boring ritualists, that's for sure! I once had the opinion of "Poetry, Schmoetry," then took a class on it that totally converted me into a lover of this most primal form of expression. Loved reading your post, Dina. In my 20s novel, I begin each chapter with a quote from my favorite poet, Gerard Manley Hopkins. Much like these poets did for you, his work helped open up my perspective of the Lord. Now, the questions. Jesus would totally drive a Jeep--it can take a punch and turn the other cheek to keep on driving, over any terrain you throw at it. Serious question: one thing that makes me feel more intimate with God is basking in His creation, especially at the beach. When I'm surrounded by the profound beauty of the world and the greatness of it, it reminds me of how greater still is the Creator. It's been years since I read poetry, but reading these makes me want to dive in again! What makes me feel more intimate with God? Reading my Bible. Over the years the words have become so increasingly personal--as if spoken directly from His heart to mine! Dina, GORGEOUS post! What makes me feel more intimate with God? When the Spirit whispers and I LISTEN, then OBEY, and no one but God and me know that I obeyed. When I'm giving my all in work that He has given and I thank Him as I work. When I cry hard over sorrowful things and laugh hard over joyful things. When I wake up in an attitude of prayer and praise. When I read posts like this. Prayer always makes me feel more intimate with God. If Jesus were alive today he'd probably drive a bus because so many people would want to ride with him. Oh Dina, thank you for the giggle this morning! The joke at the start of your post brought a smile to my day, and reminded me to keep my mouth shut if I don't have something nice to say! Serious question: Having those unbidden, random conversations with God. Lovely, Dina. The poems speak to me and are worth meditating over. I am hanging my head in shame because I have no puns, ugh! I'll have to tell your accord joke to my kids, Lisa. Anyhoo, I was thinking that Jesus might not own a car. He might ride the bus or subway, surrounded by a variety of the people He came to save. And He'd definitely give his seat up to an older person or a pregnant lady. Hi, Dina: I've heard that joke from the viewpoint of monks. Love it. The poems are beautiful and I took your advice and read it several times. The meaning did get clearer and clearer. I'm not a poetry reader, so maybe now I know the key and will enjoy it more. Thank you. I think Jesus would walk, but if he had to drive, I think he'd enjoy a four-wheelin' Jeep to cross the deserts and feel the wind in his hair. Top and windows down to greet and bless anyone near. I was thinking either Mustang or Jeep myself, but either way a convertible. Serious question of the day: What helps you to feel more intimate with God? Time spent in meditation. I guess being a mom with 2 kids, a 2 year old girl and a 6 year old boy, would make me to desire quiet to be intimate with God. It allows me to relax when I can get it and to truly feel his presence. There have been times it has made me want to weep with the joy of it. Non-serious question of the day: If Jesus was alive today, what kind of car do you think he would drive? A bus because he would need room for all his disciples. Hey Dina! Lovely post. Lovely poems. I really enjoyed the ones you shared. I especially love the one by St. Catherine. What makes me feel more intimate with God? Sitting in my car at the beach on a stormy day while listening to praise songs. Or, driving toward the mountains on a sunny day while listening to praise songs. Those are my favorite moments because it always seems that whatever is on my heart, God ministers to me through different sights and just the right songs at just the right time. Ex: snow-capped mountains peeking over the top of a fog misted valley with patches of sunlight shining here and there at just the moment the song Indescribable comes on the radio. Is that God's timing, or what? The thing that makes me feel more intimate with God is worship. Getting into that where you feel like you're singing directly to God, and He's just smiling down on you. Love it! As for Jesus and his car, it would be a fabulous '63 Mustang... cuz Jesus is one cool dude. Deb, I'm a little slow on the take here, but I realized I should mention that the originals would be in Italian and Arabic. I like the modern translations personally. Think about it, they were probably written in the modern language of their own day. One of the differences I noticed in the Rabia poems between the Ladinsky version and older versions is that Ladinsky uses the term "God" instead of "Allah." While we could have a long theological discussion on whether the God of Islam is the same as the God of the Bible, the simple fact is that "Allah" is the Arabic word for "God" and is used by Muslims and Christians alike. Thanks everyone for commenting and stopping by. The winner of Praying God's Word Day by Day is Cherie J. Congratulations! I'll be contacting you for your address.